Hello, everyone! 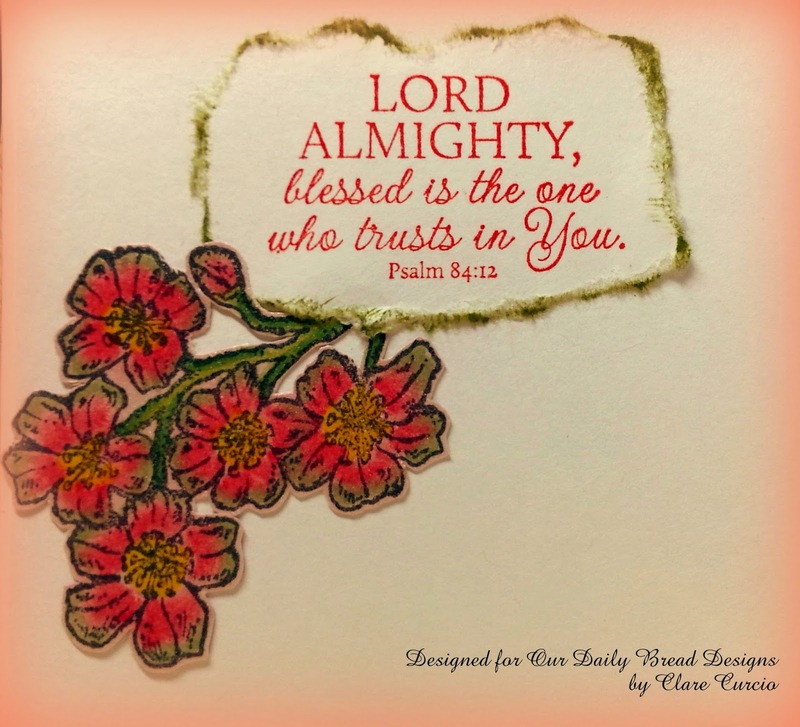 Clare here, with my last blog for the month of July for Our Daily Bread Designs. I really appreciate ODBD choosing me as their July guest designer, and I feel very humbled by all of your sweet comments over the last month. Thank you for giving me this opportunity to share a little bit of my work with some fantastically wonderful stamps and papers from ODBD! This is a very easy card to make, and didn't take long at all. I think some people would call it a CAS card (clean and simple). I started with a white card measuring 5 1/2" x 4 1/4". For those of you who are familiar with my work, I usually put something 3-D on each project. Well, this one has no 3-D, but I had to add something! Glitter! 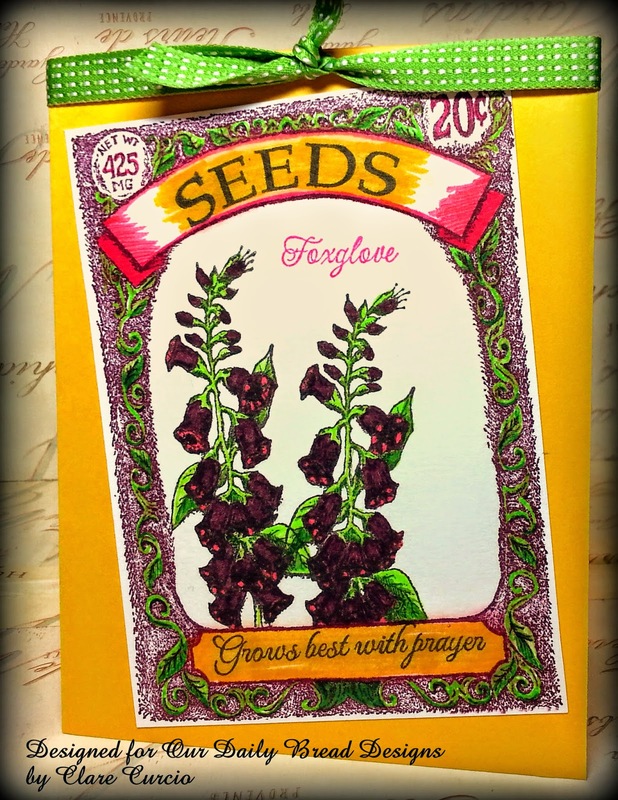 I stamped the seed packet from the ODBD set "Seed Packet", in black Versafine ink, on the front of the card. I like to use that ink when coloring with anything but Copics because of the detail it gives. Then I stamped another seed packet on a piece of scrap paper, and cut the center hole out to make a mask, which I can use over and over again, changing whatever I put in the middle of the packet. 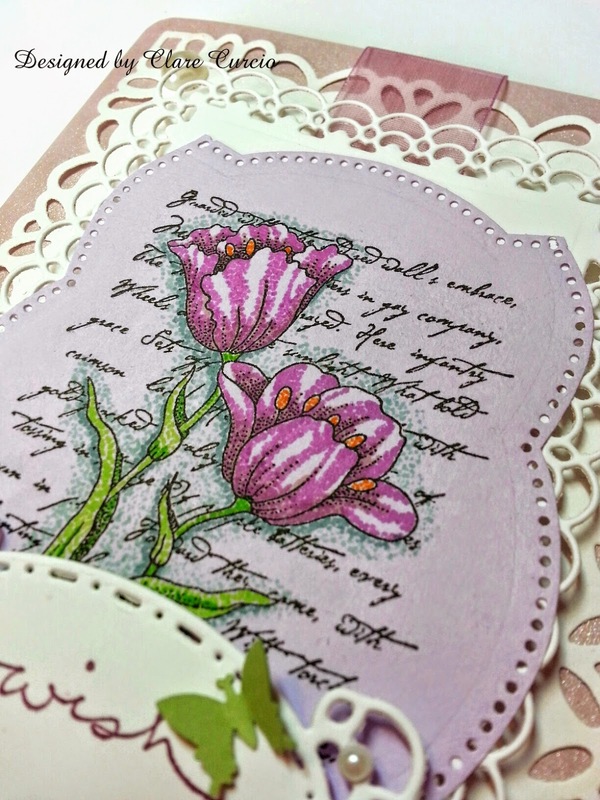 The foxglove stamp worked really well for this, and also the "Foxglove" word stamp from the same set, called "Bloom". I love that font! 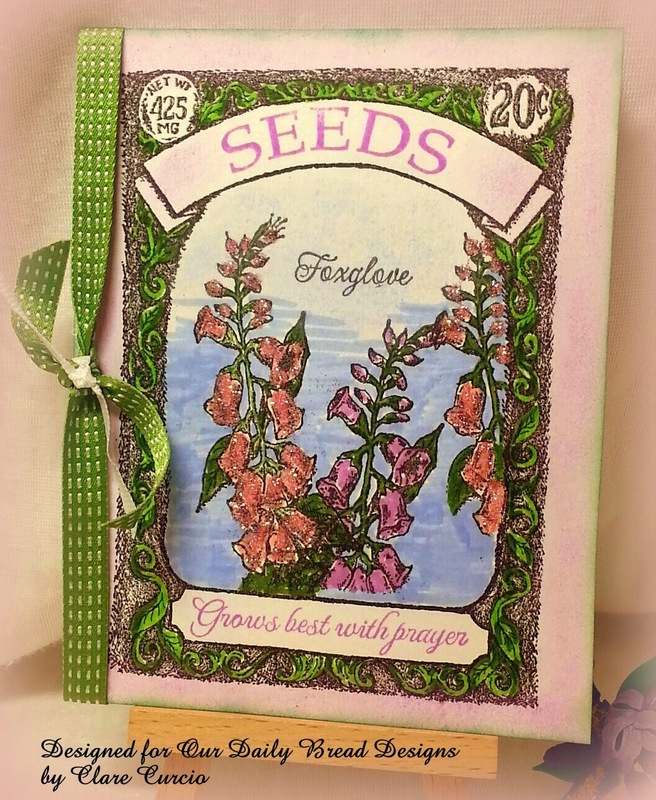 I chose the word "Seeds" from the Seed Packet set for the packet label, and Grows best with prayer at the bottom. 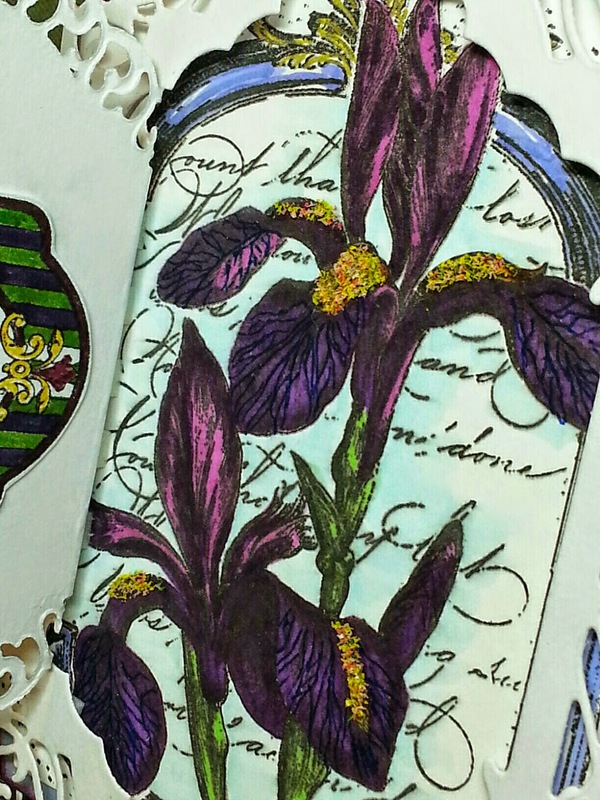 I did these in Orchid Opulence ink from Stampin' Up. A little bit of green around the edges, and some pink, orchid and blue on and around the flowers. I used some blue chalk to blend from the bottom blue to the top light blue. All that was left was to tie some Gumball Green ribbon around the center fold, with a tad bit of white 1/8" wide grosgrain ribbon through the green knot, and apply some glitter to the blossoms with a dries clear glue. That's it! I think the glitter is just the thing it needed. I have had a great time reading and learning from all of the great designers and people at Our Daily Bread Designs! I hope you have too! I'm really looking forward to getting to know the August designer and see what wonderful work she does! See you soon, and thanks to all of you! Hi! I hope you've enjoyed the week of roses, with this being day seven. Lavender is the color for today. There have been red, blue, yellow, peach, pink, white and now lavender. I hope you have a great weekend and following week! May your days be rosy! Thanks for visiting my blog, and I would appreciate any comments you may make. Take care! Now, I think you'll find this card a little different than the others. The rose was done in the "negative", or stamped on black paper, and the paper bleached - yes, bleached inside the rose lines. I embossed the rose in black on black cardstock, then used bleach and a small paint brush to paint in the white. As the bleach absorbed into the black paper, it bleached the color out, leaving what you see. I was very impressed with the elegance of it, and so unique! I'd love to know what you think! Thanks for coming! Please leave a comment - I'd like to know what you think about this technique. I again all! Welcome back to a week of rose cards. We've had red, blue and yellow so far. This one is peach, and we still have pink to go, and maybe a surprise of white. 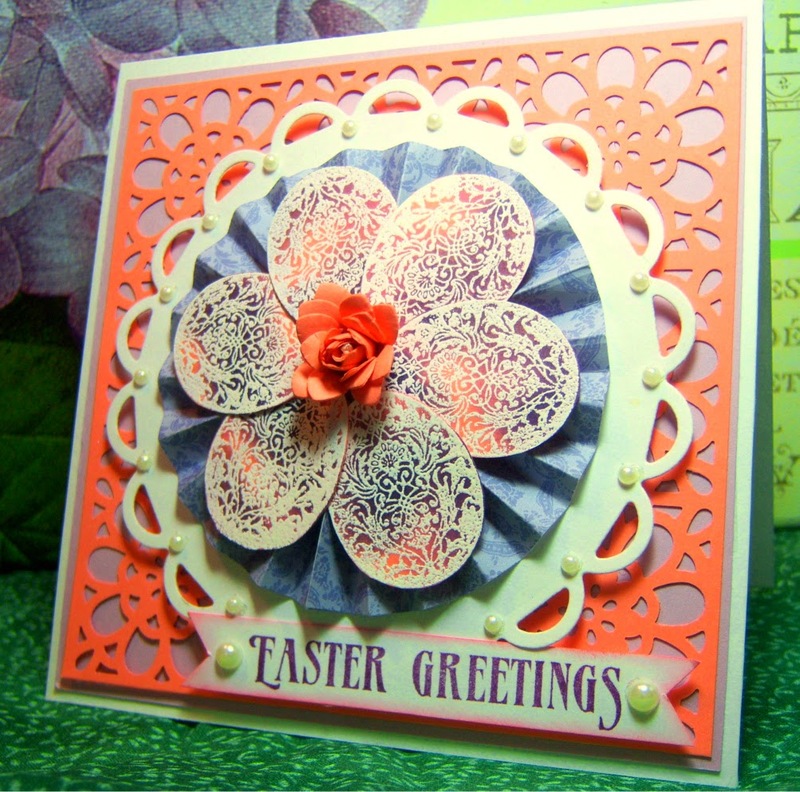 Using the same stamp, but angling the image slightly, and using a different die to cut out the outer embellishments. I added a bit more blue in the leaves this time. Here's another peachy rose card I found in my files, and thought I'd share it as well. The eggs are from a stamp by Chocolate Baroque, which I absolutely love to pieces! Hi, blog friends! Here I am once again with a new rose card to share with you. 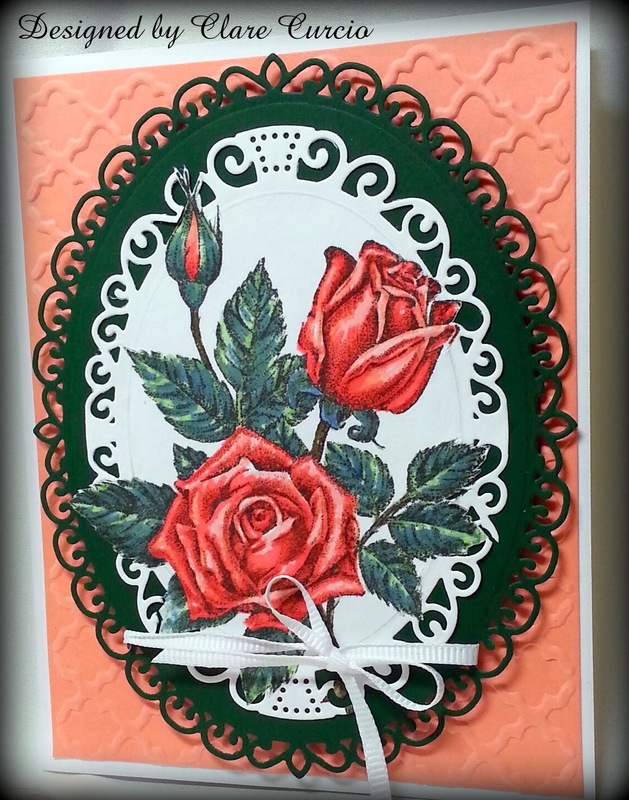 This week is A Week of Roses, and I've promised photos of cards I've made with roses on them each day. 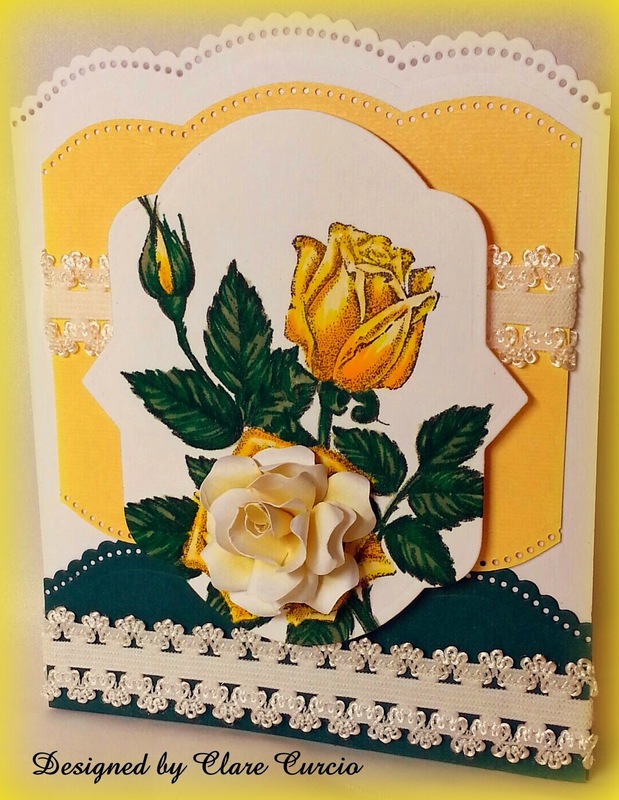 Today's rose is yellow, and I've used the same stamp as previously blogged about on the previous "Rose" days. It's amazing to me how the same stamped image can be used again and again but look totally different! This photo has a little better angle on the 3-D rose made from scratch. Tomorrow will showcase a peach rose card. I hope to see you then! Thanks for stopping by! Hi! 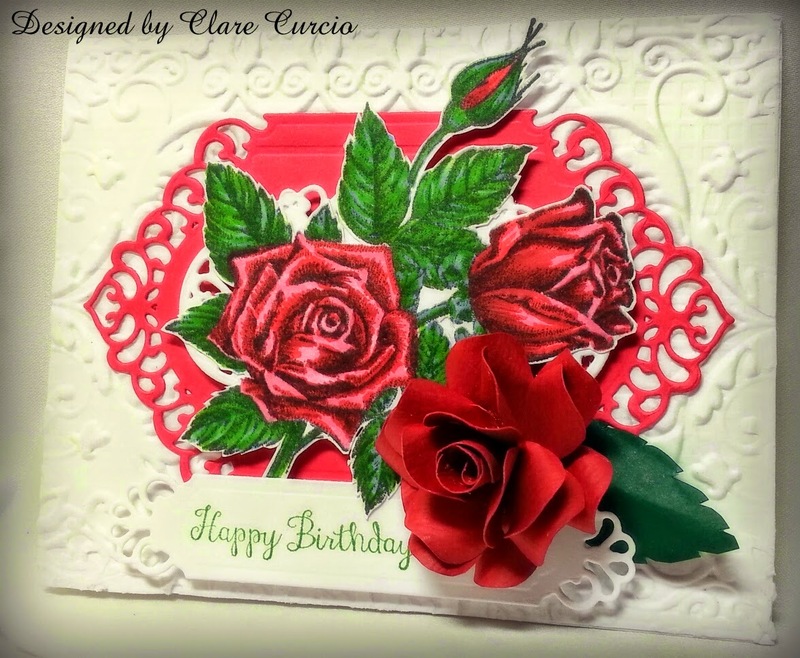 I thought I'd do something a little different this week around my other designing company blogs, and that is to blog about some of my rose cards. Each day will show a different rose card, new and past, but mostly new. My first one is this red rose. I sent this card to a friend of mine for her birthday. I don't know what it is about red and white, but with the main image stamped in black, then using those two colors- it's just a "WOW" factor. 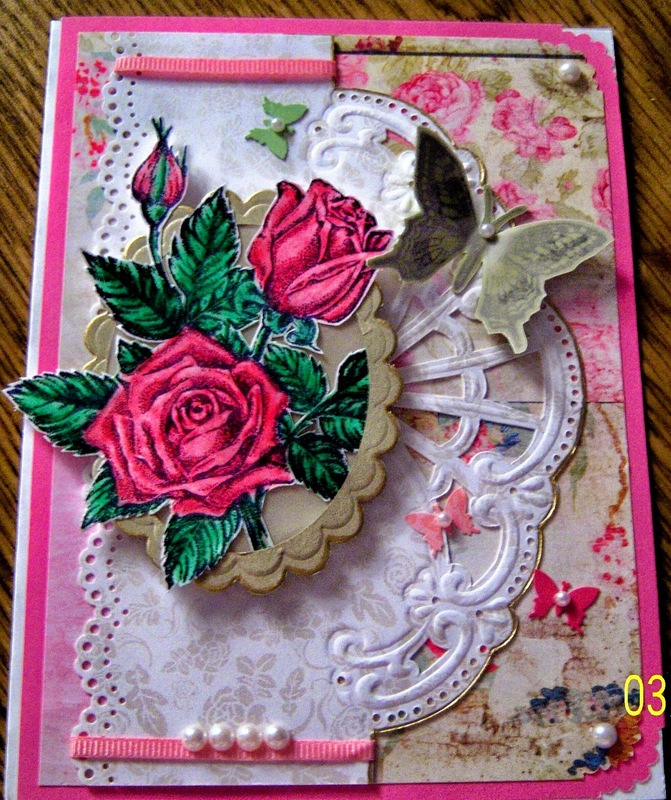 The rose stamp is from Stampin' Up, and I paired it with some of the new Spellbinders Card Creator dies, and an embossed card. Happy Birthday, Janet! Hello! "I am beginning to learn that it is the sweet, simple things in life which are the real ones after all", said Laura Ingalls Wilder. Through normal everyday life, I'm finding this is to be true. 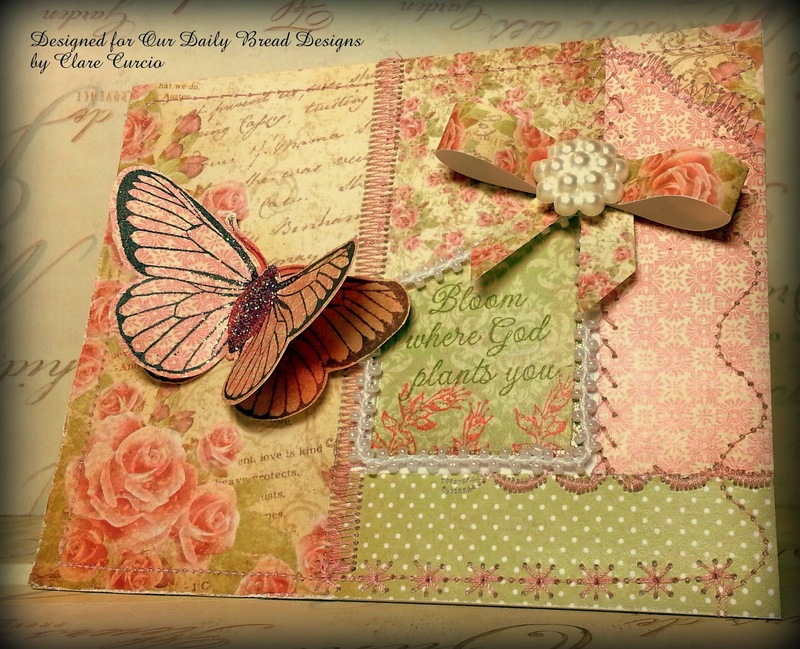 I just got this stamp from Our Daily Bread Designs in the set called "Clover". As I was going through my boxes of stamps, I found the beauty that was used on the inside that hadn't been used in a long time. This little "door" is the only part of this card that opens, which makes it unique. This iris is one of my favorite flowers. Although they've bloomed for the year, this one will live on and on. I wanted to show the detail in the flowers, and the Flower Soft I used for the "fuzzies". This last photo show the back of the card, just flipped over. 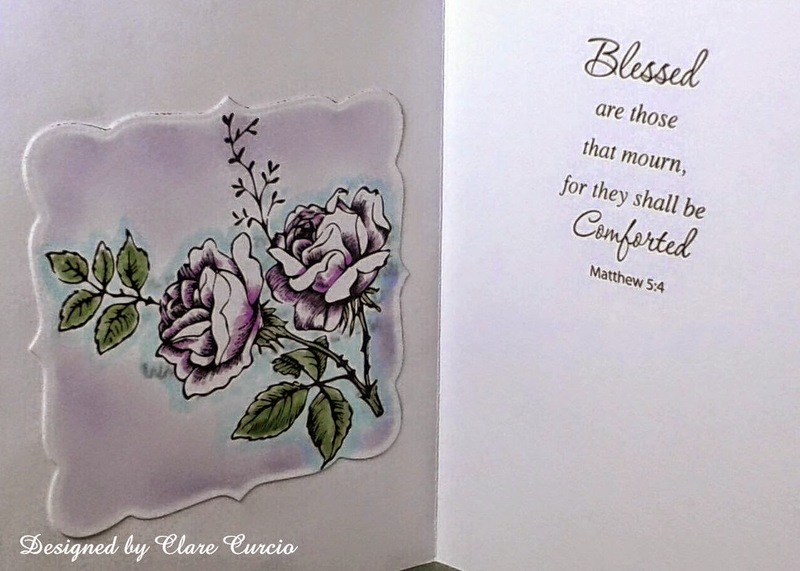 There is lots of room for the sentiment with the card dimensions being 6 1/2" x 4 1/2". Hi, dear friends! 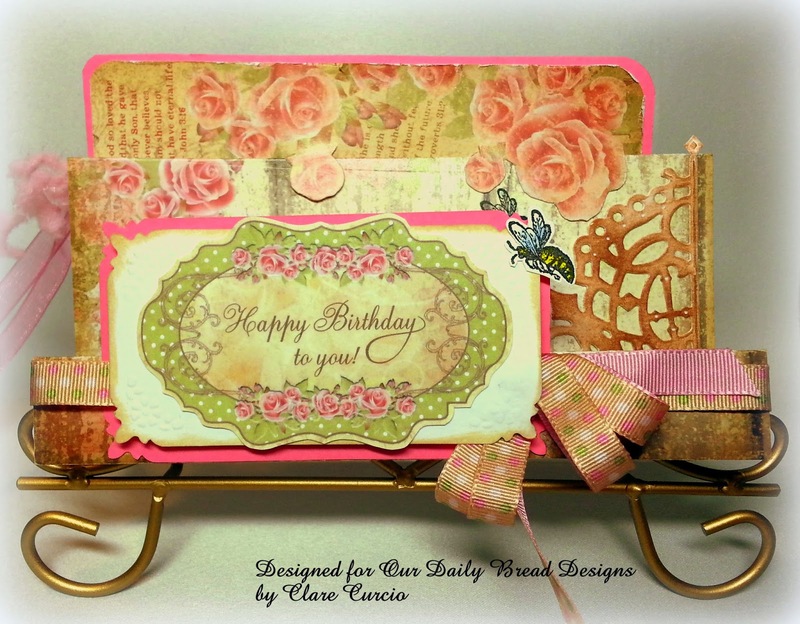 Here's my third card in a series of five for the month of July as guest designer for Our Daily Bread Designs. 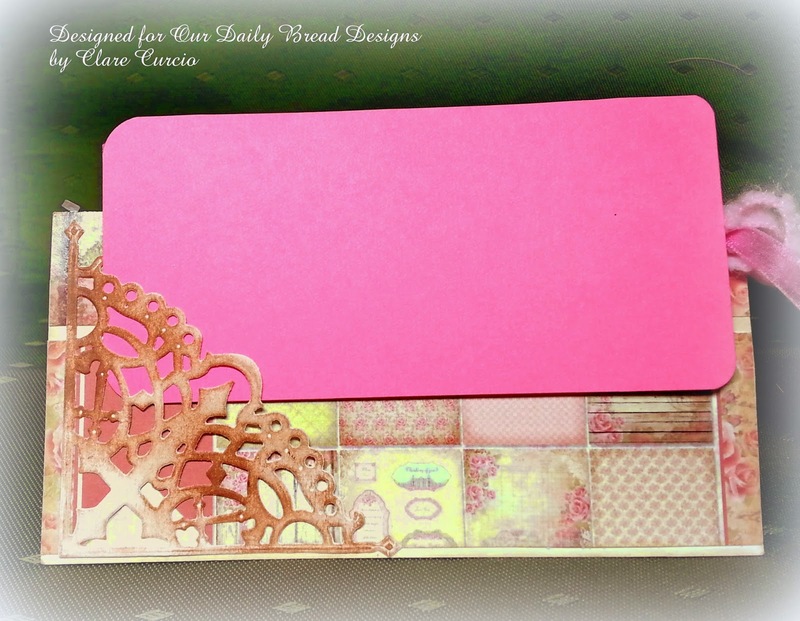 I wanted to use more of the beautiful cardstock that was in the Blushing Rose Collection. 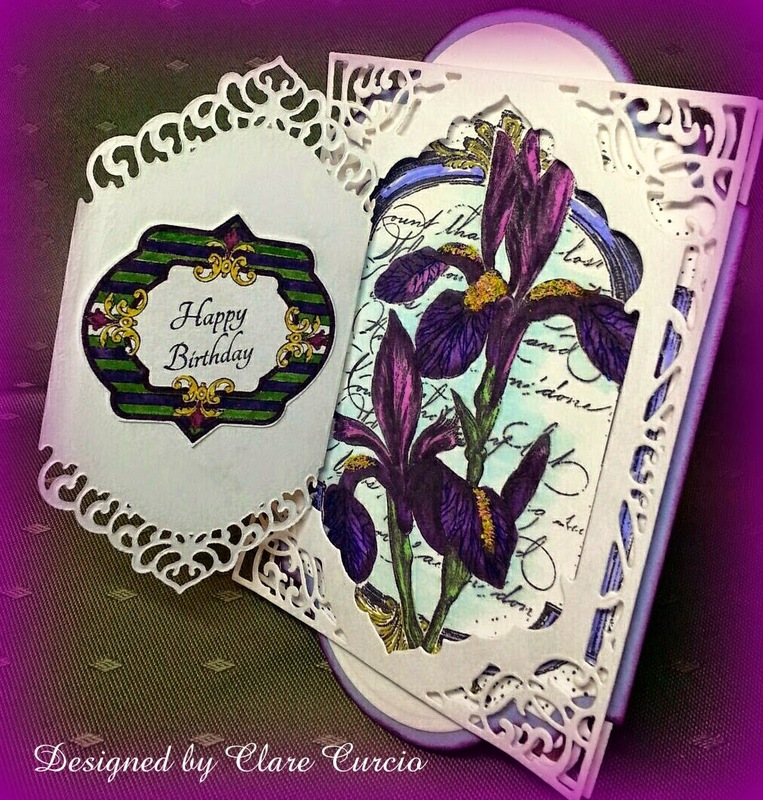 It makes layering a card with several elements very easy! I used a piece of white cardstock measuring 8 1/2" long, and 5 3/4" wide. I scored the card width-wise at the 3", 5 3/4" and 7" marks. The 3" score line is folded down, the second up, and the last down. Your card should stand up after pressing your score lines down. I die cut two of the cross corners using the die from the Decorative Corner set. Memento Rich Cocoa ink was used on a sponge dauber to "age" the cross corners. I glued one on the right bottom corner of the second panel, and one in the left lower corner on the back of the card. The glue was applied just to the very outside edges of each die cut, and not across the middle, so this could be used as an "pocket" in which to put a little card, or in this case, the bookmark. I cut a rectangle piece of white cardstock, and then traced around it on the pink cardstock, cut it 1/8 " wider than the white, to use as a mat for the white. I used the same corner cutter for each corner on both. I applied the pink rectangle to the lower right side of the front panel, then tied a length of ribbon around, then tied it in a bow near the bottom right corner of the pink mat. The white rectangle was applied with dimensionals so give it a little depth, folding over the bow loops to make the bow as shown. I hand cut the sentiment from the Blushing Rose Collection, and glued it to the front of the white rectangle. 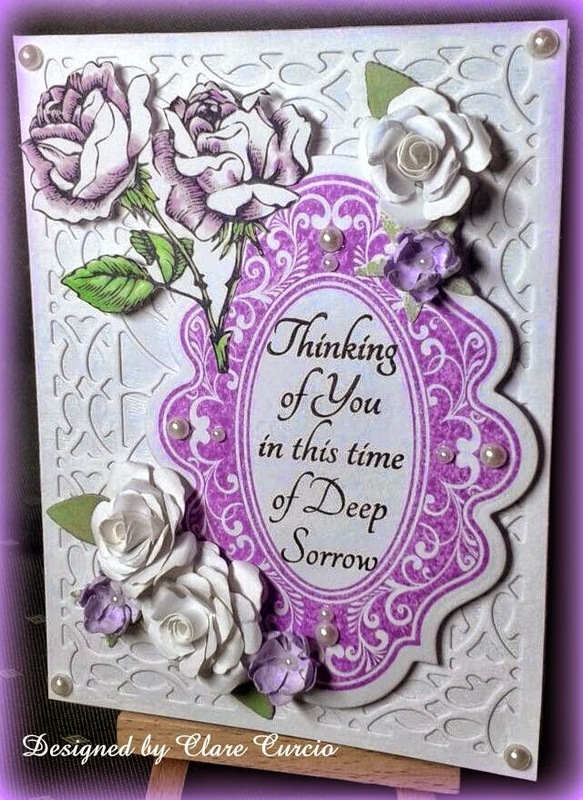 As I said, the sentiment pieces in this collection of cardstock are fantastic, and make creating a beautiful but very easy card very fast and convenient. I left the inside blank for a suitable sentiment, and writing space on the back of the card, and on the back of the bookmark. 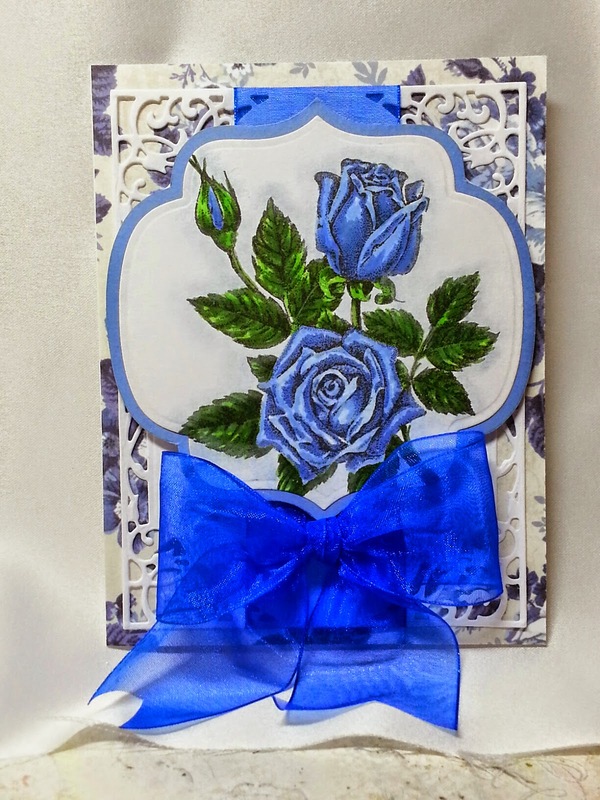 The bookmark is a scrap piece of the rose cardstock with some of the bottoms of the roses cut with a craft knife, so that they overlap the top edge of the card, while on the back, the bottom left edge of the bookmark fits into the decorative corner die cut. I rounded and distressed the edges of the bookmark, then matted it onto the same pink cardstock used before. With a 1/4" hole punched in the top center, ribbon and trim were threaded through and tied at the top. The last thing I did was to stamp the bees, color them, and cut one out. 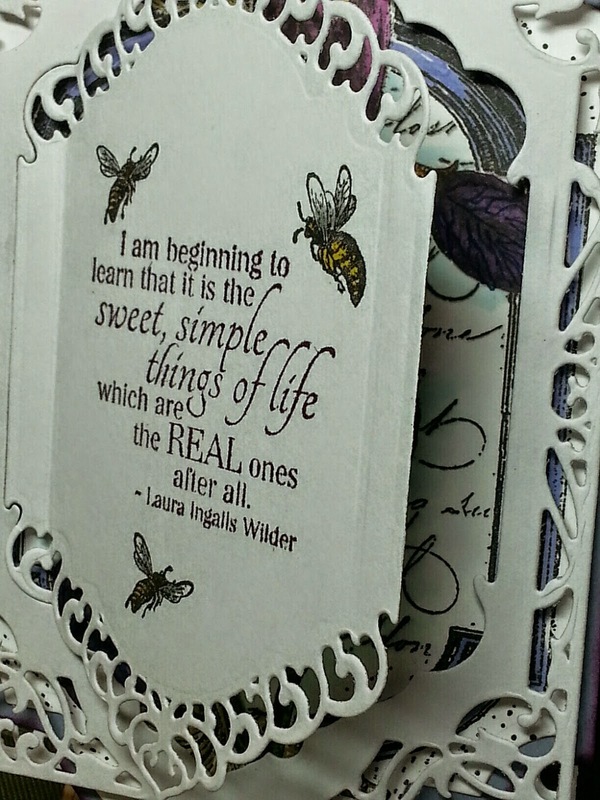 The bee on the second layer was stamped first, and then the same bee was stamped on a scrap of white cardstock. I colored them the same, with the yellow marker on the body, and the lighter blue on the wings, then cut the bee on the scrap paper out. I positioned and glued him on so that when the card was completely closed, he was overlapping the same bee stamped on the inside, so that the second bee couldn't "bee" seen! Then when the card was opened, both were visible, along with another bee stamped on the inside facing the opposite direction. I hope you'll enjoy making your version, and I'd love to see them if you'd like to link back to your page so I can visit! Please take a second and leave a comment for me, and better yet, become a follower! Thanks for visiting! Have a safe and happy summer! Hi, everyone. I purchased a duplicate set of Spellbinders Persian Motifs dies, and they are in an unopened package. Now, I know most of you have done this yourselves! It's too late for me to return the dies to the company purchased from, so I am offering them for sale at 50% off. $15.00 plus $2 shipping. Anyone out there want them? They're gorgeous! Thanks! I hope you all had a great 4th of July, and your week is going well! Hello, everyone! Happy Summer! The flowers are in full bloom, and butterflies are everywhere! 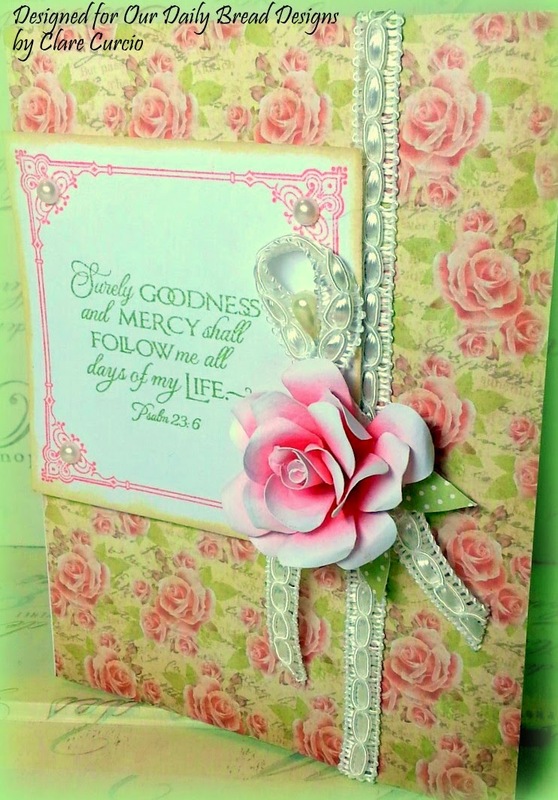 I love cards with both of these elements, and these from Our Daily Bread Designs are so impressionable! 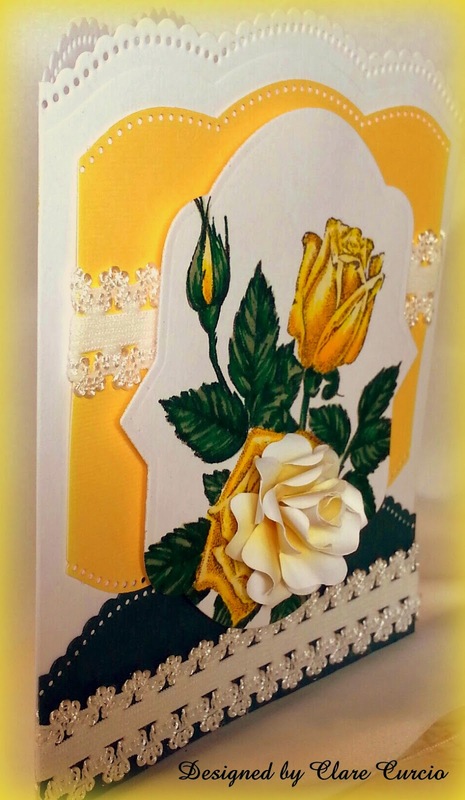 This card made for the second week in July for ODBD's guests designs, is one that I really enjoyed making - different for me with the machine stitching on it, and simple. 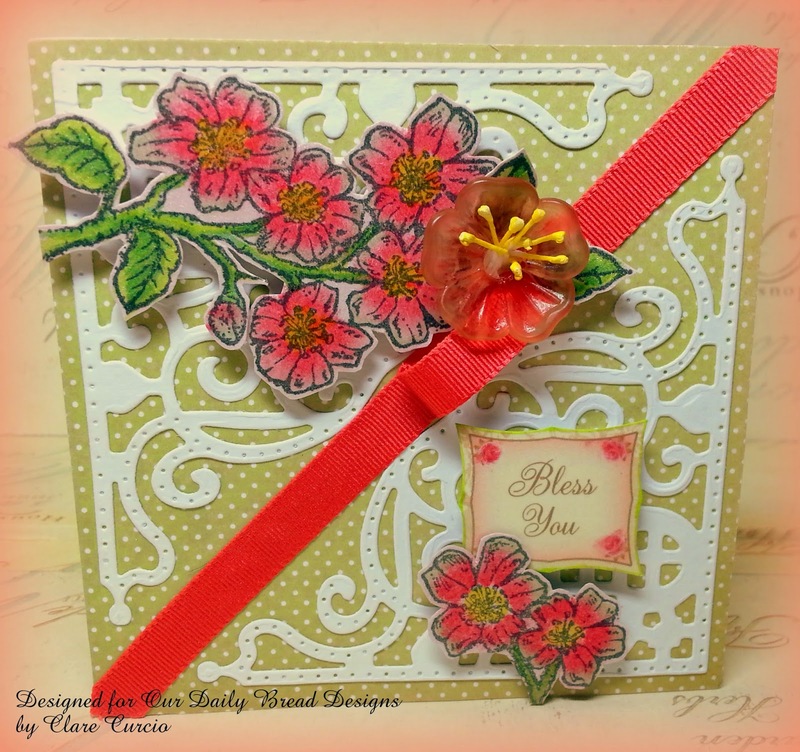 I used the sentiment, "Bloom where God plants you" as part of the focal piece, from the new ODBD stamp set, Bloom. To accompany the sentiment, I added a paper bow and twice-stamped butterfly. Below are the complete instructions, and a list of supplies you'll need to recreate this beauty. 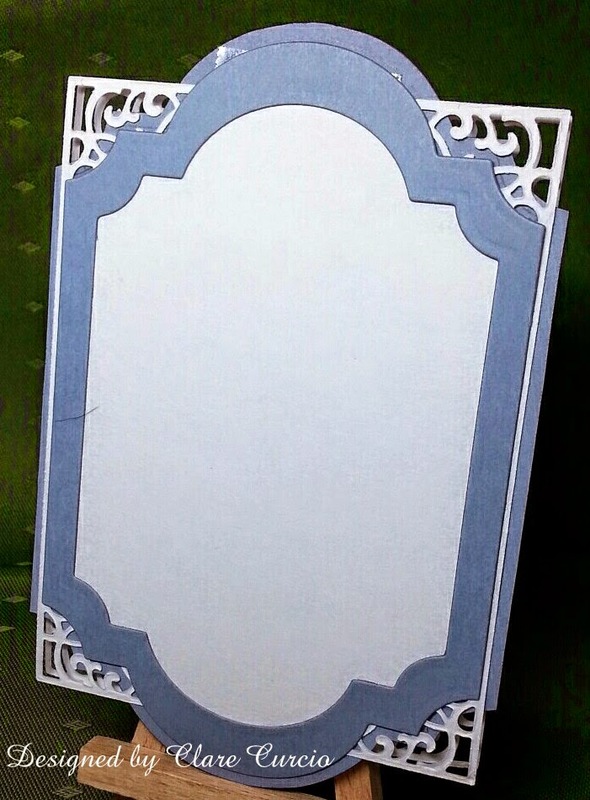 I cut a white card base to 5 1/2" x 4 1/4". 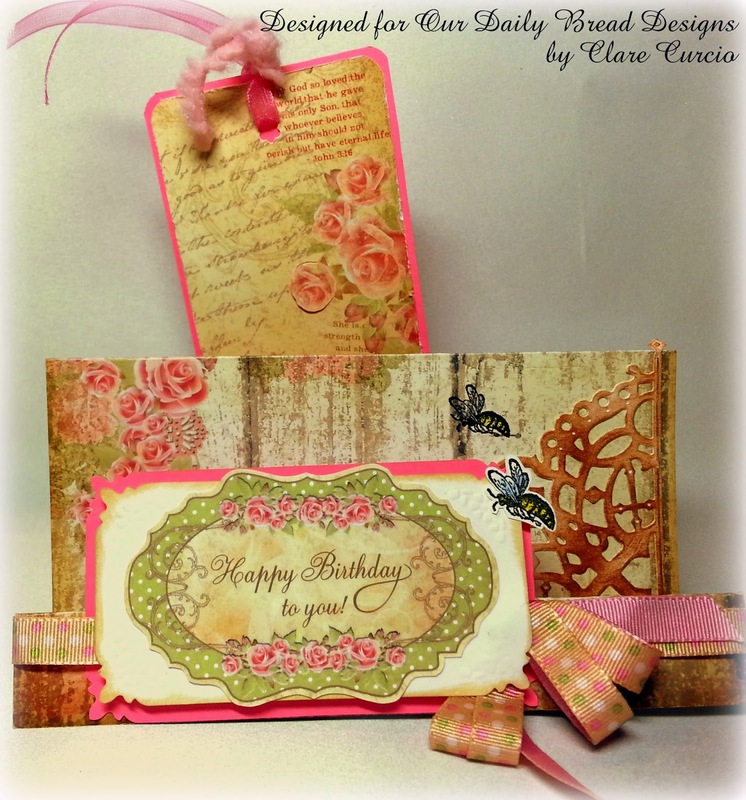 From the new paper pad Blushing Rose Collection, I chose scraps from five sheets of different, but coordinating paper. I laid them out in different ways to resemble a quilt, then tacked them down just in the centers of each scrap piece, so there wouldn't be difficulty stitching them to the card base through adhesive, which would eventually jam the needle or break the thread. I used several different stitches, as my grandmother did on a crazy quilt. On the inside of the card, I cut a piece of one of the patterned green papers to the same dimensions as above to cover the stitching back and loose thread ends. There was some small beading in my stash that set the sentiment off, so I glued it around it. 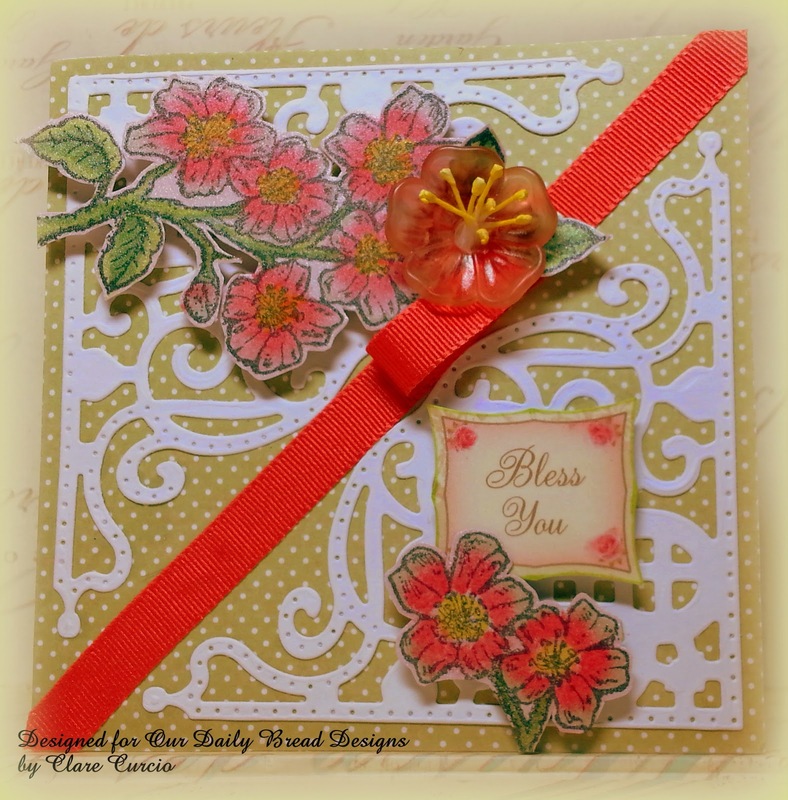 The sentiment was stamped in green, and a little of the flowers at just the top of the flower stems stamp used along the bottom of this piece, in coral. Both of these stamps are from the set Bloom. I love the font this was written in! The butterfly is a single stamp from ODBD, called Butterfly Single. I stamped it twice on the same patterned paper to match, in Versafine Black Onyx. The bottom butterfly was touched up with a little of the coral color just in the center at the body, extending out into the wing area to shade. The top butterfly I left alone with color, but did apply some glitter to the body. I glued the two bodies together just in the center, and manipulated the top one so that the wings would stand up some, and show the dimension of the bottom flutterby. 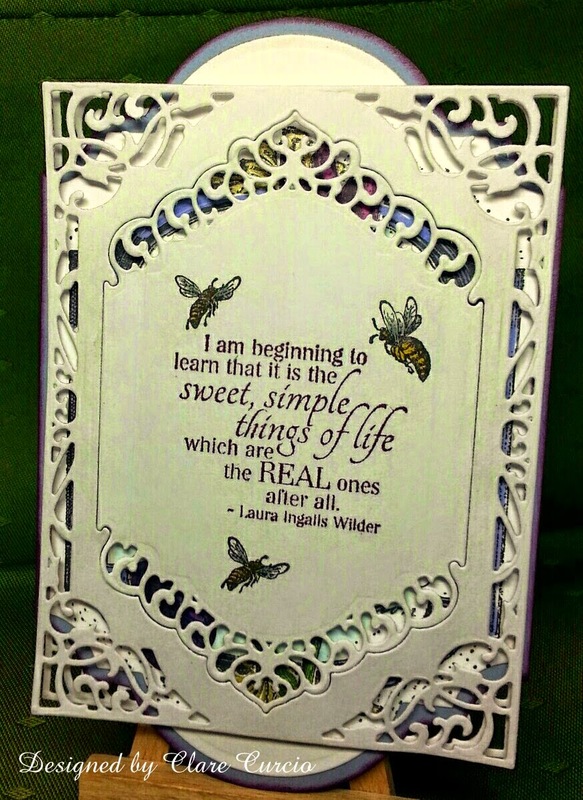 A little glue on the butterflies, and a paper bow with a button glued in the center finishes off this pretty card. Thank you for coming to visit, and I hope you've been inspired in some small way! See you next week! Have you ever had a wish for someone and didn't know how to send it? Hi, everyone. I'm sure that this wishful card would delight anyone you had a good wish for. I think it would wish someone a great day, a better tomorrow, a wish for good health, better health, a wish for healing, for comfort, for anything you can imagine. Of course, it would be a good one to send to a girlfriend, mom, sister, aunt or even someone you've never met, but wanted to wish a good day! Your pick! 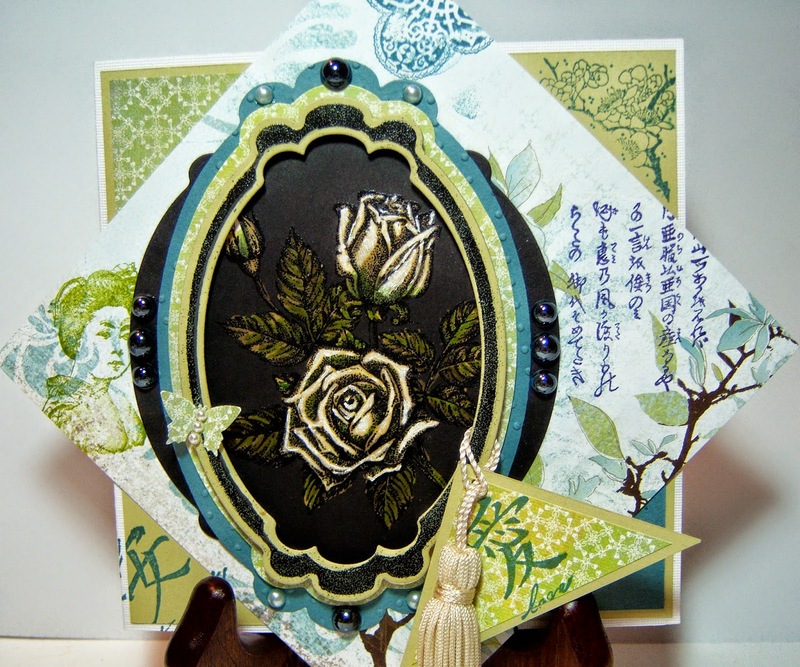 I've been really fascinated by some of the newer Spellbinders dies, and I've used four of them here. I'll be glad to let you know what they are if you'll just contact me. 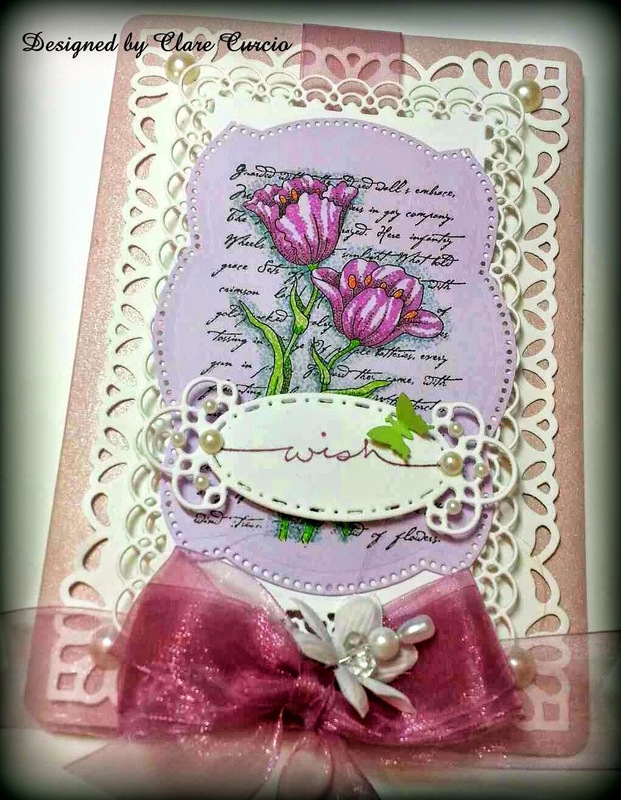 The word, "Wish", is one of Stampin' Ups beautiful word stamps. I've used them so many times. I cannot for the life of me remember where I got the image of the tulips from - if you know, can you please tell me? My mind has gone, and it's not in the last place I looked for it! I hope you enjoyed your 4th of July weekend, and tomorrow starts a new week. Have a great week, and I hope you'll visit again soon! Thanks for coming. 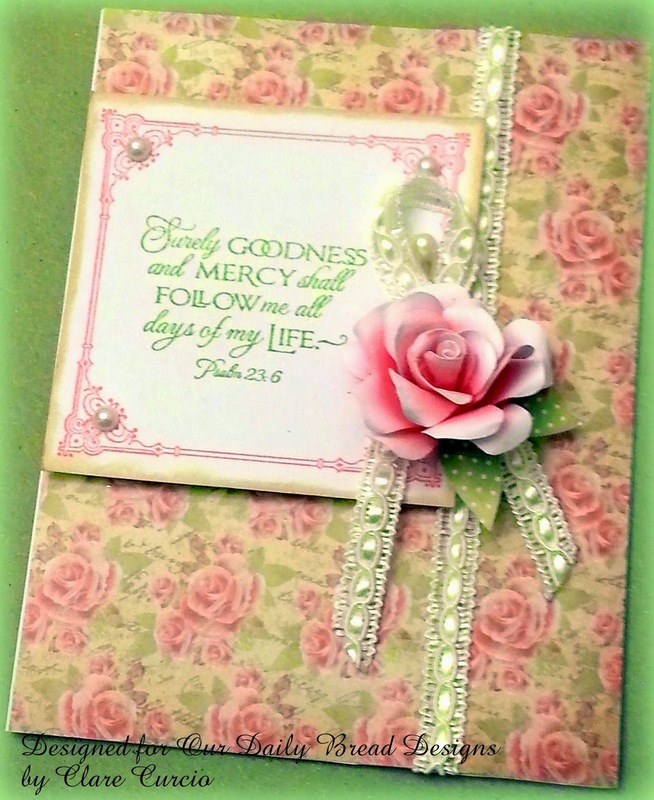 Our Daily Bread Designs - "Goodness Rose"
Well, what a blessing it is for me to have been chosen as Our Daily Bread Designs July Guest Designer! I was so surprised, and it felt like "a sweet kiss on the cheek from Jesus", as my friend Kaye used to say! It has been hard to find good quality and selection in bible verse stamps. 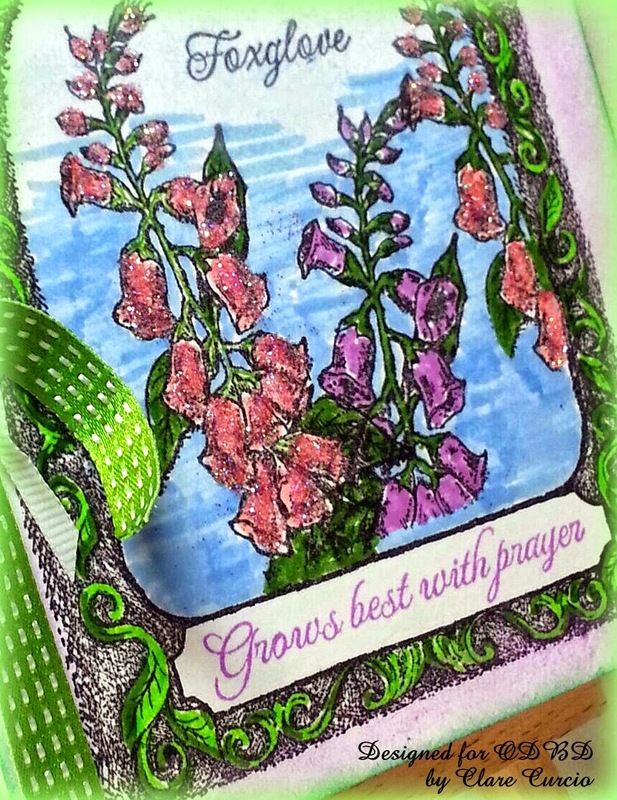 Our Daily Bread Designs is my "go-to" place! I guess I'd better get to the reason I'm here - cards made using some of the newest stamps from ODBD! For the month of five Wednesday's, I will tell you how I made the cards, then supply a complete list of ingredients. My first is this 5 1/2" x 4 1/4" card, made using white card stock as my base, then covering this with a piece of the wonderful rose cardstock in the Blushing Rose Collection. Each sheet is gorgeous, so I'm sure whatever you pick to use will be beautiful! I had some antique-looking ribbon trim in off-white that seemed perfect for an accent down the right side of the rose patterned paper, adhered to the back with ribbon tape prior to placing on the white cardstock base. On a scrap piece of white cardstock, I stamped the frame from Vine Borders in pink ink, the sentiment from the Cherry Blossom set in light green, then cut out close to the edges, which I aged with a little distress ink. I placed a pearl on each corner, and dimensional tape squares on the back. Inside, there are two scrap strips of the coordinating cardstock, and I stamped the "Thank You!" from the Cherry Blossom set to the right of these, on the left side of the card. To finish, I adhered the square sentiment to the upper left front, aligning the left edges of the cardstock pieces. 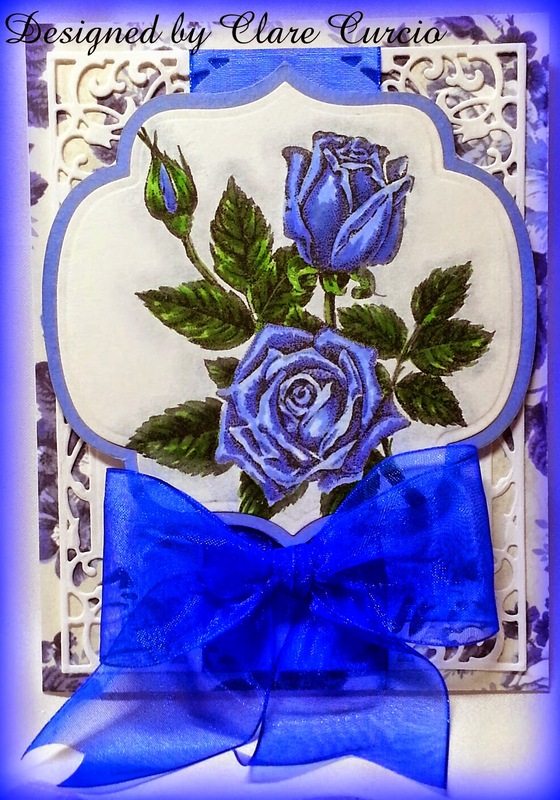 A 6" piece of scrap ribbon trim was folded in the shape as shown, and glued in place, with the rose centered on it. An off-white pearl stickpin was placed into the center of the ribbon and pushed down until the pointed end nearly protruded from the rose and ribbon. The small 1" rose is one I struggled with, trying to make my own pattern with ruffled edges on the petals. I am pleased with how it turned out in the end. There were 20 petals cut out of thin white cardstock, and shaded in pink and coral inks on the innermost parts of both sides of each petal, fanning out with color not quite to the outer edge. I shaped each petal, then glued them all together, and hand-cut two leaves out of some coordinating green paper from the above cardstock collection. If you're not into making your own flowers, a purchased rose will work just fine!